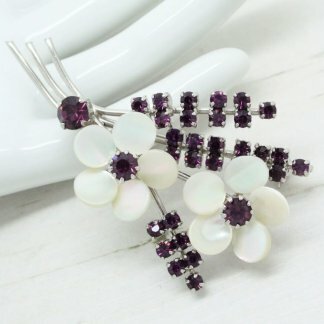 Description: A rather hard brooch to track down, I have been unable to find another like it. 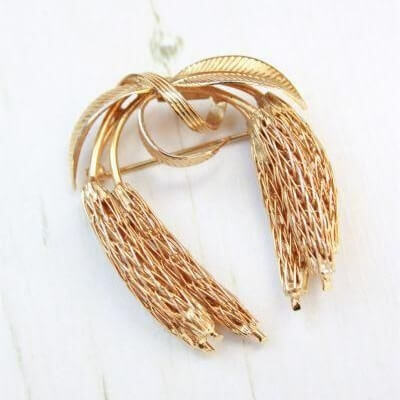 This fully signed Corocraft brooch features a unique design of mesh / gold plated wire wrapped in an almost 3d effect to look a little like wheat, or maybe the seeds from a palm tree. Detailed leafs at the top of the brooch help to finish the look. Measuring 4.8cm at tallest point it’s the perfect size to pin on the lapel of any jacket. 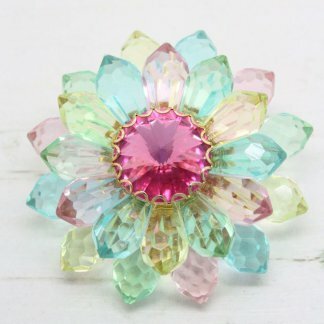 Lightweight enough to also pin onto a dress or blouse. 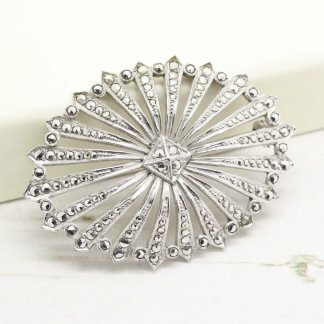 This Corocraft brooch is in very nice condition showing slight to no wear. The gold plated brooch is shiny and clean, with a fully working roll lock clasp to the back. A wonderful addition to any jewellery box or collection.